In this zip file you will find ten high resolution (600 dpi) layered tiff files. Each file contains one small dungeon you can use in your RPG products. 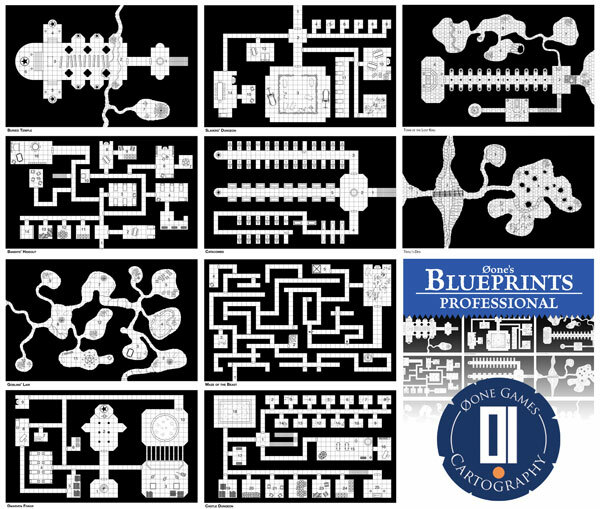 You can use these maps in your rpg products providing they are not map-only products or stock art products. In any case maps cannot be more than 25% of your product. Usage without modifying the maps: you are allowed to turn on and off any layer and use the resulting image as it is. You can however change the room numbers and the map title and add any text you want. By choosing this usage mode you MUST display the credit text and you MAY use the 0one Cartography Badge included in this product. Usage modifying the maps: you are allowed to color, cut, or otherwise modify the maps as you wish. By choosing this usage mode you MUST display the credit text and you CAN NOT use the 0one Cartography Badge included in this product.